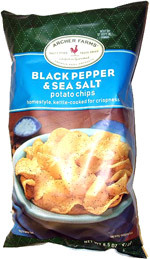 Taste test: I'm still debating whether a salt and pepper flavor is better on a kettle-style chip or a regular chip. It's hard to top the Utz Salt & Pepper flavor (a regular chip), but others tell me they like salt and pepper chips on kettle style chip (including the Kettle brand chip). This brand would fall in that category, as these are kettle-style chips with a good amount of salt and pepper flavor on them. The pepper didn't overpower the rest of the chip, so there was a good amount of saltiness, and of course there's a great crunch from the kettle chip. If you like those Kettle-brand chips, you'll end up liking these as well. Archer Farms (and Target) has a winner with these. Smell test: Slight pepper aroma, but not overpowering or harmful to the nostrils.